Some of my friends on twitter have this cool idea called a blog off. We each post on the same idea, which today is about living large by being small. We include a list of each others’ blogs at the end. Fantastic Idea! It’s possible we began thinking bigger was better when we decided bigger meant richer, more powerful, successful, cool. Size meant status. (Please save me from becoming too graphic, ok?) Bigger houses, bigger cars, bigger tv’s, even bigger meals. And bigger bodies, and bigger med bills. This problem of size is a modern living problem, I think. Pioneers didn’t build too big; they were naturally frugal. Who wants to chop extra logs to build or heat a cabin? And the windows were mercilessly tiny – good for security, no doubt, but who can live without BIG glass? And the Great Depression, World War II – they saved gum wrappers and built Victory Gardens. No wasters among them. Then came the hippy generation, free love and rock n roll. Wearing blue jeans and peasant blouses, car-pooling in VW vans to Woodstock, the long hair generation knew all about earth living. You might say they were wasted, rarely wasteful. Every little seed pod was treated like a royal gem. Then we blew it. About forty years ago, houses, cars, cities, meals, waistlines, you name it, everything just grew. And grew. And grew. Why? Only answer I got is: Because we could. Pretty damn lame in hindsight. It’s sort of the Wal-Mart philosophy, right? Save more by buying more. Actually might mean you spend more because everything is supersized. But those unit prices dropped to the basement. Wow, look what I got for xyz dollars. Smart, right? Now it seems the bill is coming due. And the thing about size as a yardstick for life – someone always has something bigger!! We got too big. Doh! 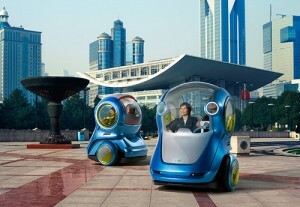 We saw environmental limits – generally, smaller is greener. Our keenest inventions are shrinking. 20th century – skyscrapers, highways, dams. 21st century – gaming, Iphones, nano-tech and bio-tech. And then there’s this pesky never-ending down-for-the-third-count Recession that has put a strain on most everyone’s bank account. We must conserve. In other words, small is cool. Big is ugly. Out with hummers, McMansions, and sprawl. Now we want to be small. But… what’s small? Small people? Really, I am very small human – five feet and under 100 pounds. 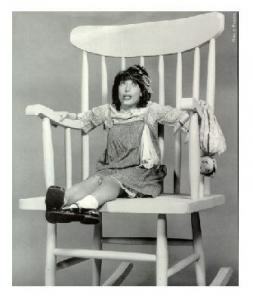 In that big rocking chair, Lily Tomlin outdoes me. In other words, small is relative. Alice in Wonderland figured that out with those magic cookies. First that room fit; then it didn’t. Next to Shaq, everyone is small. In other words, if we can play with size so readily, does small or big really matter? Yes, it does. It matters because we got too big, consumed too much, and now we have to craft a strategy, an image of small that means beautiful. Small that we love, small that we identify with, small that ignites our dreams. Is it possible to dream small and believe it’s big? small cars, small apartments, small houses, small towns (I love that vid). Part of American spirit is Small Town USA. 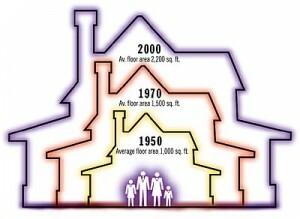 Now we are making an entirely new era of small streets, smaller houses, and certainly smaller yards with New Urbanism. So what is wrong with small? 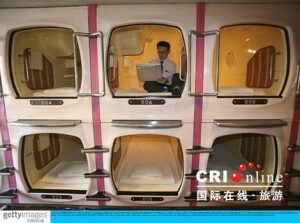 There is such a thing as too small, for example those coffin hotels in Tokyo. chair’s too small; these shorts don’t fit. Small can mean efficient. Or it can be another word for scrimping, miserly, and small mindedness. And it can mean dying, as in a town that used to be 150 people and became two. Except the husband died; now it’s just one. And one person running a town can be a bit sad. 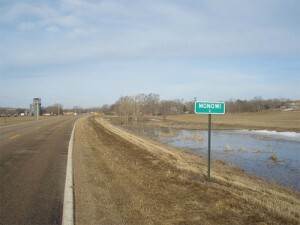 The Town of Me. Too small is a lot like too big. Someone’s always going to dream something even more mini, micro, nano, quark-sized. You cannot win at this game; it’s a loser. Because the idea of “how much” is a function of deficit thinking. One pie with a missing piece; you just can never fill it up. Welcome to Quality. Yup, it’s a value. When you say something’s better, you’re talking values. Values are one thing to you and maybe different for me; it’s what you care about, what matters to you. So you can’t say how much until you know what’s better, what you value. If all you care about is size or quantity, then stick with bigger or smaller, how many, how few. Otherwise, let’s think about a boundless variety of delicious pies. Now I think we have to scrap the whole idea of size. It’s not about small or big; it’s about fit. We need the best fit. And fit is more than size, it’s also of the right kind, the characteristics that suit your needs, your particular ideas of your life. We have to think about the kind of place. Ok, we have to know how much as well, but I really want to know how well it fits, and then I can say how big or small it needs to be. Imagine a builder’s model kitchen and a boat galley do the same thing, one perhaps clumsily and the other with optimum craft. Better design creates efficiencies. How much comes after how well it suits its purpose. In fact, it’s not the fit on day one; it’s the lived-in fit. The fit for all seasons and uses, my good moods and bads, my favorite moments and my security gaps. The place that enlivens me and protects me from the cold cruel world. Where I have my finest and my worst moments; where I am more of myself, relaxed and inspired, a safe haven for soaring ideas. For me, a home is my outer skin that holds me and my family into one larger embrace. My lived-in place supports intimacy and freedom. Before figuring fit, we start with our wants and needs for today and the future. Then we build to that. Rather than specifications of monster sizes or teeny tiny efficiencies, think in terms of elegance and quality, richness in purpose, what matters most. 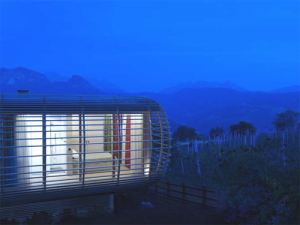 Because I’d rather have the most elegant, sustainable home that fits my aspirations and habits and those of my family. A house of my dreams is not too small, or too big. It’s just so, a lived-in fit. Here’s my friends who also wrote about living smaller. Veronica Miller at Modenus, A Small Life is Good, but Slow Down to enjoy it! Paul Anatar at Kitchen and Residential Design Is Living Smaller the New Living Large? 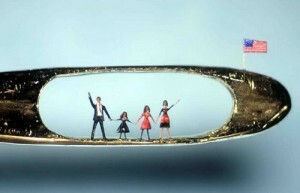 Nick Lovelady at Cupboards Kitchen and Bath,Is Small Really Realistic? 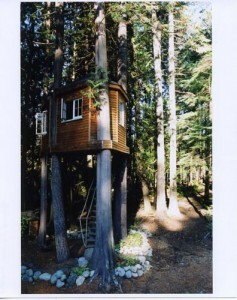 Becky Shankle from Eco Modernism,Is Living Smaller the New Living Large? Sean Lintow’s The Homeowner’s Resource Center,Building Smaller, Is it the Next Big Thing?